This elegant starry tree is printed completely in foil. With this design you can choose the colour of the foil and the colour of the board you would like too. 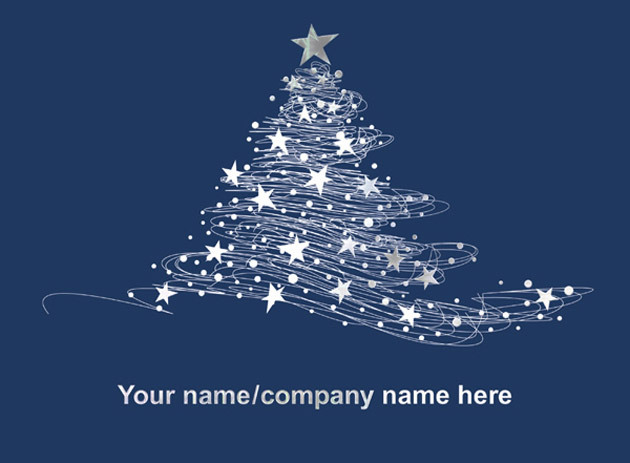 Add your caption and company name in your chosen foil colour too. The board colour options are: ebony, imperial blue, purple and red. Your tree can be printed in silver, gold, white, green, holographic silver or holographic gold foil. A truly personalised Christmas card, tailored especially for you. With this design you can choose the colour of the foil and the colour of the board you would like, together with the text you would like printed on the front of the card. By purchasing the Starry Tree - Front Personalised Christmas card 10p for each card you purchase will be Donated to the Charity of your choice from the Charities listed below.